Trying to describe the last 2 minutes of this game can be enough material for 2 games. Basically, all you need to know about the first 57 1/2 minutes of the game was that the Pens dominated but so did Lundqvist and somehow Erik Christensen managed to deflect it off some traffic and into the net. The Pens squandered several major powerplay opportunities during this majority of the game, and it appeared that they were on their way to a 1-0 loss. Then everything changed. Just a few moments after being robbed on a point blank chance, Chris Kunitz pushed a rebound past Lundqvist to tie the game up at 1 and send the capacity crowd into a frenzy. But if you thought CEC was loud then, you should have heard it 38 seconds later. Matt Cooke took a pass in the offensive zone and walked in relatively unguarded as he fired a wrister past Lundqvist to put Pittsburgh up 2-1. While the Pens celebrated, Lundqvist was furious with himself for allowing a goal of that nature and slammed his stick violently over the crossbar. This earned him a 2 minute unsportsmanlike and left his team on the PK for the rest of the period. And just when it seemed that the Pens would just run out the clock (and that was EXACTLY what they were ONLY trying to do), the Rangers struck back. Brandon Dubinsky marched the puck right up the ice and gained the offensive zone, and before the Rangers could even get the extra attacker (to even it up at 5 on 5) out on the ice, the puck had found its way directly to Marc Staal. Staal fired a point blank shot past Fleury to tie the game up and erase all the momentum gained by the Pens. The Pens seemed to have recovered and once again commanded the tempo of overtime, but all it takes is one mistake to change the entire game. With less than 1 minute 1/2 remaining in overtime, Zbynek Michalek fell over his own legs and Brandon Dubinsky blew right past him on the side boards en route to a 2 on 1 breakaway. Dubinsky then put a slick deke (that even I have to admire) on Paul Martin and dished it to a wide open Ryan Callahan for the tap in. As heartbreaking as it was to watch, it was probably one of the best stickhandling plays of the season thus far and props to Dubinsky for that. There are so many to choose from considering the game changed so many times at the end, but I am going to be a bit abstract. Lundqvist never throws his tantrum = his team not being inspired nor do the Pens fall into a complecent lazy prevent on their powerplay. Pens don't get lazy on their powerplay = no game-tying goal = game never gets into overtime = 2-1 Pens. Offense: B+ They actually looked quite good, but up until the end King Henry had an answer for nearly all of their shots. Defense: B+ Set aside those 2 mistakes at the end and you actually have a very nice performance by the D unit. 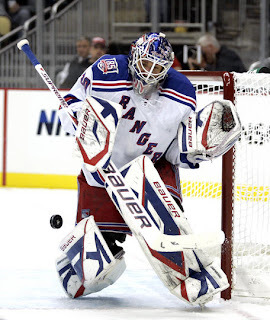 Shut down Gaborik and his cherrypicking all game and held the Rags to just 22 shots in regulation. Fleury: B 2 goals against isn't a bad performance (because the 3rd was impossible). Most days this would have been enough to get the W.
Powerplay: D 0 for 6, gave up the game winning goal shorthanded, and had no sense of organization. They were trying to get shots to the net, but looked like a cluttered chaos all game long when trying to set up the PP attack. Defenseman were shifting too low and then taking horrible routes back to the point, and the forwards were often too deep. Penalty Kill: ? Never had a chance to get to work. -Letang and Orpik were very effective in shutting down Gaborik with the double-team move. Letang would chase him down from behind while Orpik would be waiting in front to break up the play. I like the way those 2 play together, and I also like the Martin-Michalek pairing. -Arron Asham put out another solid performance for Pittsburgh. He doesn't always score, but his fundamentals are as solid as any grinder in the NHL. There is nothing special about his shooting/skating abilities but his positioning on the ice and his very accurate shooting are just as valuable to the Pens as his hitting and fighting abilities. -If you want to see the glass as "half full," the Pens at least got a point out of a game that looked like they weren't going to get any.